A friend of mine called me to check out his TV which had a problem,As usual I took with me minimum test equipment, digital meter, screwdriver, iron gun and some soldering wire. Upon reaching his place he was out of the house but the children were around,After introducing to them my mission, they pointed to me the Television. I wanted to know a brief history of the TV and one of them who was there as the TV went down told me that she was just watching a program and saw a line on the screen and that was the end of the TV program. Now, once I heard a line on the screen two things came to my mind,It is either a vertical or horizontal problem and to make proper conclusions I inquired from her how was the line oriented. I mean was it across the screen or vertical? Her answer was vertical line. I applied power to the set and indeed I was able to get a blue line from top of the screen to the bottom. So with that I concluded that the problem is on the horizontal circuit in particular horizontal deflection (width) circuit. This includes horizontal yoke, S-correction capacitor, linearity coils not forgetting dry joints on these components. You can relate to the actual components here. Again let me point out here that the most probable cause for this is open circuit or component and not a shorted component, A shorted component will load down the set such that it will not even start. With that I decided to open the set and went straight horizontal deflection circuit and this is what I saw. Without touching the meter I concluded that I have got the culprit even before taking the board to my work bench. Since the HOT was not shorted, we can conclude that C438 is still doing its job of protecting the HOT. So I was very sure that even if I replace this capacitor which was burnt it will not solve the problem. 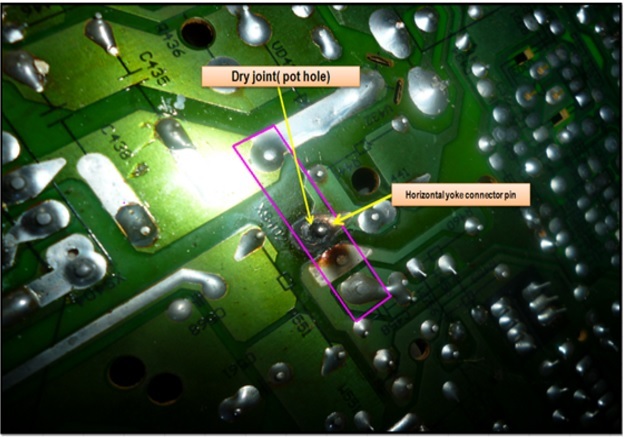 So I turned the board the other side and I noted a burnt mark and I was interested to know which component leg was it. This explains the vertical line on the screen and I re-soldered it thoroughly. 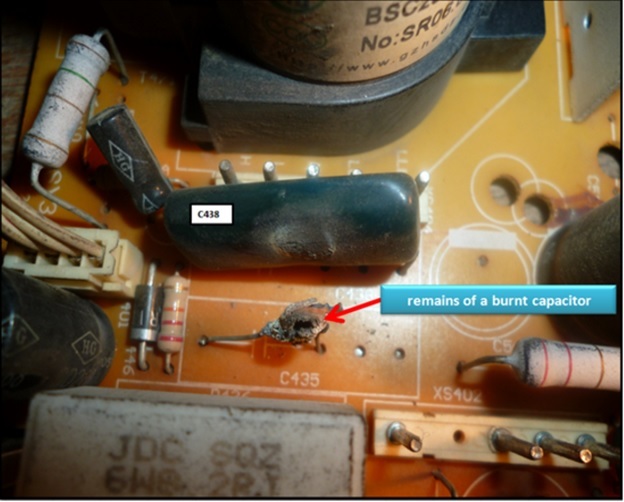 Back to capacitor C435, This capacitor was burnt completely and therefore the part number was missing. To go round this problem, I took another junk china TV board in my shop and checked the value of this capacitor. The one I got had two capacitor marked 822J 1600v and the other in 332J 2000v, and the one I was repairing had one capacitor marked 922J 1.6Kv and the other was missing (burnt). So I decided to do some calculation to figure out the burnt capacitor value. 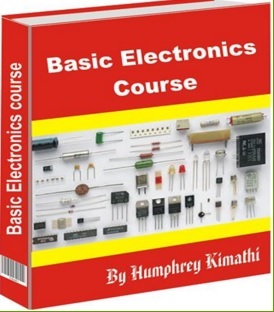 First let me point out here that all ceramic capacitor come with body marks and the first thing to is to interpret them, I have done a detailed method on en-cording them in my basic electronics course book. For now let me say that the marking on ceramic capacitor body are in pF (just write down the first digit and the second digit as they appear on the capacitor body and the third is the number of zeros to add after the first two digit. In this case 822 will be 8200pF and 332 will be 3300pF, now since the capacitor are arranged in parallel we will add to get the total capacitance and hence we get 11500pF, So any combination of capacitor to substitute must be around that figure. I continued checking the junk board around and I finally got one cap 322 from a CRT junk monitor board and replaced the burnt one. Now I have total capacitance (8200+3200=11400pF) which is within our working. Please note that I also replaced the partially burnt capacitor because I figured out that it will be a matter of time before it also succumbs due to injuries sustained from the burnt neighbour C435. When replacing the snubber please consider also the working voltage of the snubber which must be the same used on higher. Never use a capacitor rated 400volts as snubber, should be at least 1200volts and above. After replacing the two components and re-soldering the dry joints, I went back to the owner and re-assembled the set and after applying power everything went well and the TV was back to normal. thanks for your valuable information you have shared. 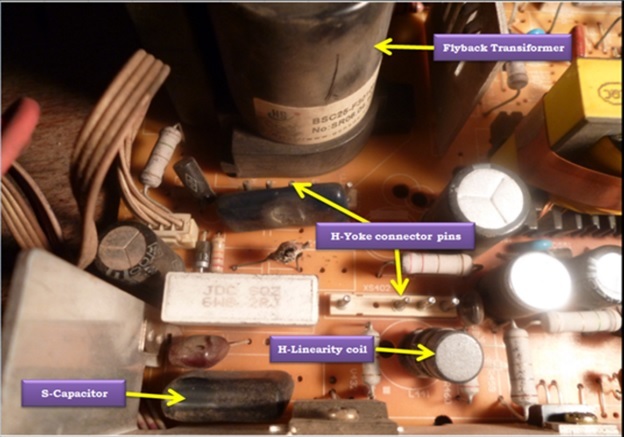 Thank you so much sir, i have a crt tv, that is have pincushion problem, audio is ok, i adjusted the preset, but no use, i could not see any swollen capacitor or any dry joints, will you please explain me...... I am waiting.... for your reply..... please....!!!!!!!!! If you are sure it is pincushion problem concentrate on that circuit. 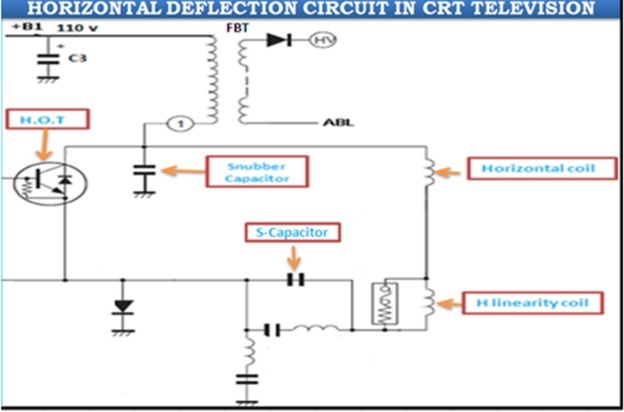 I warmly welcome your News Letters and CRT TV Repair articles and i have to repair CRT TV similar problem like yours. Thank you so much. Thanks Humphrey for this brilliant approach and repair techniques. Its really phasing out naiveness in me and also other readers am sure! sir good day..I want to know how to adjust its vertical size and horizontal using remote control..please give me the code or the sequence..thank you..